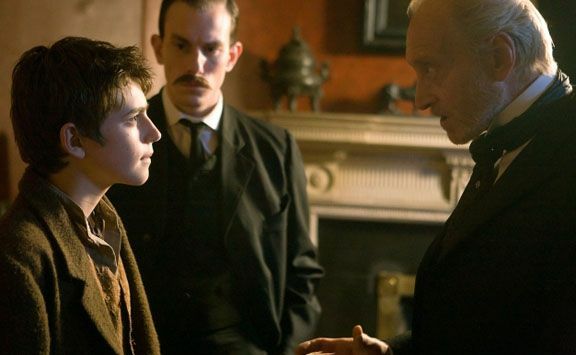 In the two-part SyFy original movie Neverland, from writer/director Nick Willing (Alice, Tin Man) and premiering on December 4th and 5th, actor Charlie Rowe (The Golden Compass, Pirate Radio, Never Let Me Go) plays Peter, a 14-year-old pickpocket who, along with his young gang, is mentored by English gentleman Jimmy Hook (Rhys Ifans). When they are all transported to the magical realm of Neverland, during the robbery of a mysterious orb, this new world sends Jimmy over the edge, and Peter must fight to protect his friends and Neverland itself, taking his first steps on the path to becoming a legend. Question: How did you come to be a part of Neverland? 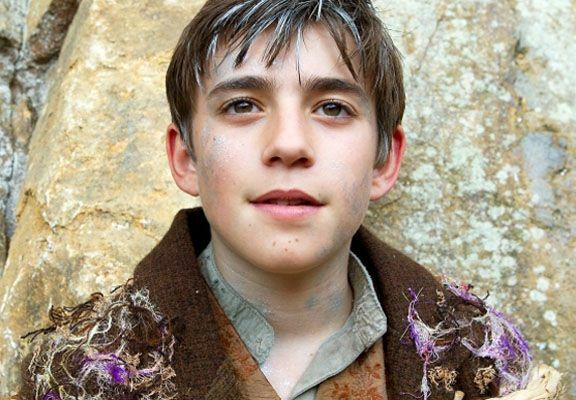 CHARLIE ROWE: Originally, I went up for the part of Fox, who’s Peter’s best friend. I read the script and I was just like, “Oh, it’s such a great script! I really want to play Peter!” So, I met (writer/director) Nick [Willing] for the second time because I met him when I was about nine. I did a short film with him. And, Nick called me the day after my auditioned and was just like, “I want you to read for Peter,” which was amazing. And then, I did a couple more auditions, and then got told I had the part. I danced around my house ecstatically, for several days. What was your first introduction to the story of Peter Pan, and what impression did it leave on you? ROWE: I think everyone is introduced to the Peter Pan story when they’re very young. Everyone has read the book and watched the Disney film, and all that. This story is part of everyone’s life, which is why I was so excited about playing the part, and also why it was very daunting. I was apprehensive because I’ve got such big boots to fill. Obviously, I enjoyed the story very much. I’m absolutely amazed at the amount of sword fighting I had to do. That was lovely. But, the most captivating thing, for me, is the fact that everyone has their own idea of how people got to Neverland and how this story exists. What Nick has done is write this incredibly dark, twisted tale, which is quite shocking. You don’t really expect it. And also, the cast is absolutely amazing. When I heard that Bob Hoskins was going to be in it, I was just like, “I am doing this film!” The cast was absolutely fantastic. The whole shoot was just incredibly enjoyable. Nick is just an absolutely wonderful man, who makes everyone feel happy, all the time. We just had such fun. Everyone was so nice to each other, and we had an absolutely amazing crew. It was just a really enjoyable shoot, and I think that comes across in the film, really. Since just about everyone in the world is familiar with the story of Peter Pan, where is the character at, at the start of this film? 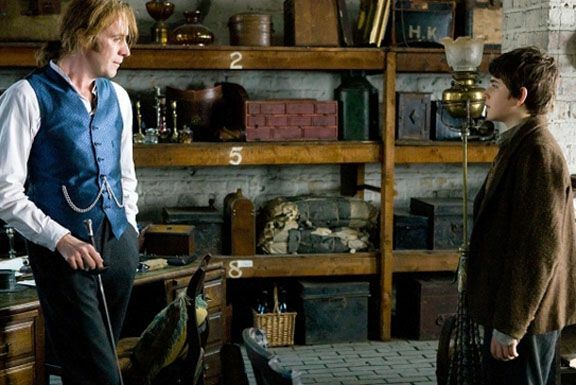 ROWE: This story begins when Peter is part of a pick-pocket gang in London, and Rhys Ifans is Jimmy Hook, who is the leader of this pick-pocket gang. Peter is the leader of these lost boys, and he effortlessly moves them around London, picking pockets and stealing things. That’s where it starts off. Peter has not got a father or mother. He’s an orphan, and he’s in a little gang. We’re in London, but we shot in Ireland, which was very strange. Are there qualities in Peter that you most associate with and can identify with? ROWE: Yeah. 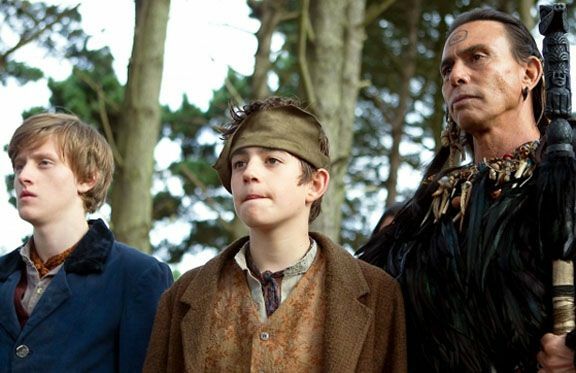 At the beginning of the story, Peter looks up to Jimmy Hook. He very much idolizes him and wants to be him. I very much want to grow up, now. I want to be able to do a job, just to be able to prove that I can do things. I just want to be out in the world, which is exactly the same as Peter. He doesn’t want to have the limitations of age and innocence. He just wants to be doing what he does best, and leading. But, I really saw Peter in Nick, who directed the film. This film is his baby, really. He’s had the idea, for a long time. He hasn’t grown up, really, since he was a little boy. He’s still 17, in his brain and his soul. I think he is Peter Pan. He’s an absolutely wonderful character that just prances about, making everyone feel great, and he has a lot of power. He was one of my main influences for my character. I really studied Nick, in that sense. Was there extra pressure, in doing this, because it was such a passion project for Nick Willing? ROWE: Yeah, I suppose. I’ve never really looked at it that way, but yeah, there probably was. I hope we did him justice. He deserves it, really. It’s an amazing script and an amazing film. I hope we all did it justice. What was it like to work with Rhys Ifans and develop the relationship between Peter and Hook? ROWE: It is a very complex relationship that takes so many twists and turns. I had such a great time with Rhys, and Anna [Friel] as well. They were sort of my mother and father figures on set, even though my mother and father were there. They really taught me a lot, and I’m still great friends with both of them now. I had a great connection with Rhys, and we both understood what our characters relationships were, and we understood the twists and turns that they took. We just connected and it just worked, the minute we met and rehearsed. I’m glad it looks great because we had a ball doing it. Aside from having such great actors to work with, was it fun to have an ensemble of your actors to work with for the Lost Boys, that were close to your own age? ROWE: We had such fun. We nearly got banned from the hotel because we were so naughty. We used to chuck things from the windows. It was a ball. We had a great time. Peter has very different relationships with the pirates, the Indians, the tree spirits and the Lost Boys. Was it fun for you, as an actor, to get to explore so many different relationships and sides to the character? ROWE: Yeah, it was. There’s just so much to the part. There’s the sword fighting, there’s the flying, there’s the emotion, and then there’s the heartbreak that he guys through. The character takes so many twists and turns. It’s great for an actor, really. It’s an ideal part. I learned so much from doing so much in this film. Because it goes on such a journey, I felt that I went on the journey with Peter. I learned as he learned. What was Nick Willing like to work with? In dealing with so much green screen and effects, how was he, as far as making sure you guys always knew what you were dealing with? ROWE: We had three weeks, at the end of the shoot, where it was just full green screen every day, so we’re all sick of the color, by now. Before we started filming, Nick showed us storyboards and animated images of what we were going to be looking at, what was going to be behind us, and what world we were going to be in. So, we had an idea of what it would look like and it looked absolutely amazing. That made it easier to picture the environment. Also, I’ve worked with green screen a lot. I did The Golden Compass, which was on green screen as well. I think green screen is great because you can imagine what you want and get the reaction that you want and feel what you want. It’s just not as obvious. I love it. How difficult was the process of actually getting you to fly, and how much did that hurt to do? ROWE: Oh, it hurt! It took me about half an hour to get into the harness, and then we had four guys just screaming across this warehouse about how to pull me across, upwards and downwards. We spent a long time on it. We did 12-hour days, and I would just be up there, all of the time. I would rehearse up there, on my lunch break. It hurt a lot. I can’t even describe the pain. But, it was such a great experience. It’s also a pretty fantastic feeling, when you’re in the Peter Pan pose with your foot pointed to your knee, and you’re flying across the room and swooping down with your sword. It’s an amazing feeling! It was great fun. Did you spend a lot of time trying to figure out how you wanted the movement of the flying to look? ROWE: It’s actually really interesting, the movement of the flying. If you point out your right foot, then you immediately fall down and turn upside down. If you point out your right foot, and then hold out your left arm, then you balance. If you relax your foot, then you fall backwards. You have to be so careful with your movement, and you have to be completely tense, all the time. It was a great experience. It was good for my aerobics. It was really good fun. We practiced every lunchtime, and then did some weekend sessions as well, on the wires. It was a great learning experience, actually. Did you really learn to play music on the penny whistle? ROWE: Oh, yeah. I play saxophone, anyway, and it’s quite similar to that. It’s a lot smaller, though. First of all, everyone was loving it. I was learning how to play “Iron Man,” by Black Sabbath, “I’ll Be There For You” and stuff like that, and everyone was loving it. But then, by the end of the shoot, I think everyone wanted to kill me. It was just a really annoying instrument. But, it was great, at the beginning. I loved playing it. In fact, I’ve still got it. It was great fun. When you finally got to see the finished product of the film, what most impressed you? ROWE: The most amazing thing for me was that we just had an absolute ball on set. It didn’t even feel like we were making a film. It just felt like we were having a laugh. And then, when you see the film, it just looks amazing. We were having such fun. How could we make something as good as that? It’s pretty overwhelming, to be honest. I was so happy with how the sword fights looked. Me and Rhys were not very good. We were quite clumsy. But yet, the sword fights look so quick and sharp and elegant. It was just a great feeling to see that, really. It was very overwhelming. What did you learn about acting, from this entire experience? ROWE: I feel like I went into the project as a child, and I think I’ve come out of it as an actor. I had such great lessons taught to me by Rhys and Anna, and by Charles Dance and Bob Hoskins, and even by Nick. I’m really grateful to all of them. I suppose I’ve learned how to really become the character and engage as my character. Before we were shooting, me and the Lost Boys would be running around, having an absolute ball, while you’d find Rhys and Anna really taking time to get into their characters. They really did teach me a lot, actually. Do you have any idea what you’re going to do next, as far as acting goes? Are you working on anything now? ROWE: Not at the moment, no. I’m reading a lot of scripts, at the moment, and really wanting to do something. I’ve just got a lot of school exams, and they have to take priority, at this time. They’re not nearly as fun, but I’ve got to get them done. But, I really want to do some filming, as soon as possible. Hopefully, that will be possible. Have you given any thought about the type of work you want to do, or the type of career you want to have? ROWE: I don’t know. Obviously, I’m quite young and I haven’t really thought about what films I’d like to go into yet. I love challenging films, really. I’d prefer to do some gritty, challenging roles. That would be awesome, and really fun. Maybe I’d even like to do an epic film, even more epic than Neverland. I haven’t given it that much thought, but I definitely want to carry on acting. In terms of role models, I’m actually really interested in Rhys’ journey because he’s had a lot of different types of roles. He’s had a lot of comic roles and dark roles. He’s played villains and goodies. It’s interesting, really. I just want to be as diverse as possible, at the moment.